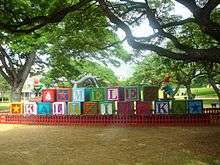 Christmas in Hawaii is a major annual celebration, as in most of the Western world. This festival was introduced to Hawaii with the arrival of Protestant missionaries, and is believed to have started after 1820. Most of the traditions they currently celebrate come from the missionaries. Before the Hawaiians celebrated the Christmas people know today, they had a festival named Makahiki which lasted around four months and in which all wars were forbidden. The season still had the essence of "peace and goodwill to all men", which is another thing people tend to associate with Christmas. 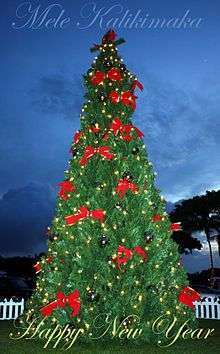 The first recorded Christmas in Hawaii was in 1786, when the captain of merchant ship the Queen Charlotte, George Dixon, was docked on the Hawaiian island of Kauai. Dixon and his crew celebrated a large Christmas dinner that included a whole roast pig. The annual Honolulu City Lights ceremony features a 50-foot Norfolk pine Christmas tree decorated with bright lights and elaborate decorations. There is also live entertainment. The traditions on Christmas day are similar to other places; a large meal is eaten and then, as the beach is often nearby in Hawaii, surfing or swimming often takes place in the waters, and musical groups with guitars and ukuleles and dancing hula entertain the crowds on the beach. Santa hats are worn and the traditional Santa's sleigh and reindeer are replaced by an outrigger canoe pulled by dolphins. The different cultures and ethnic groups that have settled in the islands celebrate the Christmas traditions of Hawaii in their own unique ways, which may be religious or plainly secular. Even Santa Claus (Hawaiian: Kanakaloka) himself is not wearing his corporate red and white suit, but has swapped it for flowery Hawaiian clothes. Christmas wreaths are made from the poinsettia plant. The phrase "Mele Kalikimaka" can be translated from Hawaiian to mean "Merry Christmas". It is also a Hawaiian themed Christmas song composed by Robert Alex Anderson in 1949. The phrase is borrowed directly from English, but, since Hawaiian has a different phonological system (in particular, Hawaiian does not possess the /r/ or /s/ of English, nor does it have the phonotactic constraints to allow consonants at the end of a syllable), "Merry Christmas" becomes "Mele Kalikimaka". There is also a more modern take on this song, called Melekalikimaka by rock band The Beach Boys from the compilation album Ultimate Christmas. Wikimedia Commons has media related to Christmas in Hawaii. 1 2 3 4 "Hawaii Christmas – Christmas with Aloha, Mele Kalikimaka!". Aloha Hawaii. Retrieved 2011-12-14. ↑ "Hawaiian Christmas and New Year's Phrases and Words – Celebrating Christmas in Hawaii". Gohawaii.about.com. Retrieved 2011-12-14. 1 2 "Christmas Traditions in Hawaii". Merry-christmas.org.uk. Retrieved 2011-12-14. ↑ "Christmas Tradition in Hawaii". Christmascarnivals.com. Retrieved 2011-12-14. 1 2 3 "Christmas Traditions of Hawaii". Allthingschristmas.com. Retrieved 2011-12-14. ↑ Golston, Chris; Yang, Phong (2001). "White Hmong loanword phonology". In Féry, A.D. Green; van de Vijver, R. Proceedings of HILP. 5. University of Potsdam: Potsdam. pp. 40–57. ↑ "Beach Boys – Hip Christmas Music". www.hipchristmas.com. Retrieved 2011-12-26.